Siliguri: A portion of National Highway-31D’s railway flyover guarder collapsed at Kativita near Phasidewa NH 31 (Railway Line) towards Ghoshpukur in Siliguri early morning on Saturday today. No casualties have been reported. Restoration work underway. Railway authority didn’t sasy anything till now. Recalling the Posta flyover incident, a four lane flyover beside railway station has collapsed. The qualitative strength of the material used in making the flyover standing before question. 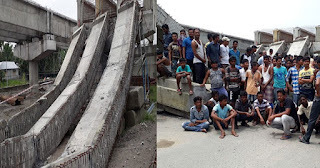 On the other hand, National Highway-28 in Basti of Uttar Pradesh has also faced almost a same situation where an under construction flyover collapsed. Two people have lost their life and four are critically injured.